Melbourne comedian Steele Saunders is having a very busy and productive time. Not only does he take part in running the successful venue Spleen on Bourke Street Monday nights but he also puts together a popular weekly comedy podcast. I Love Green Guide Letters consists of Steele and a couple of comedy guests getting laughs out of the letters in The Age newspaper’s TV magazine The Green Guide. It’s not that hard, as its often enraged letter writers are currently obsessed with the Green Guide not being as green as it should be and The Age saving money by no longer stapling the pages together, amongst other non TV related things. Also the letters are pretty much an excuse for comedians to get together and be funny. There are rules at I Love Green Guide Letters; 1 As in Star Trek’s Primary Directive of no interference, the Podcasters will not send letters into the Green Guide, 2. Steele will read the letters out in a high pitched silly voice and 3. There is no talking during the letter reading until he has finished reading the entire letter out. 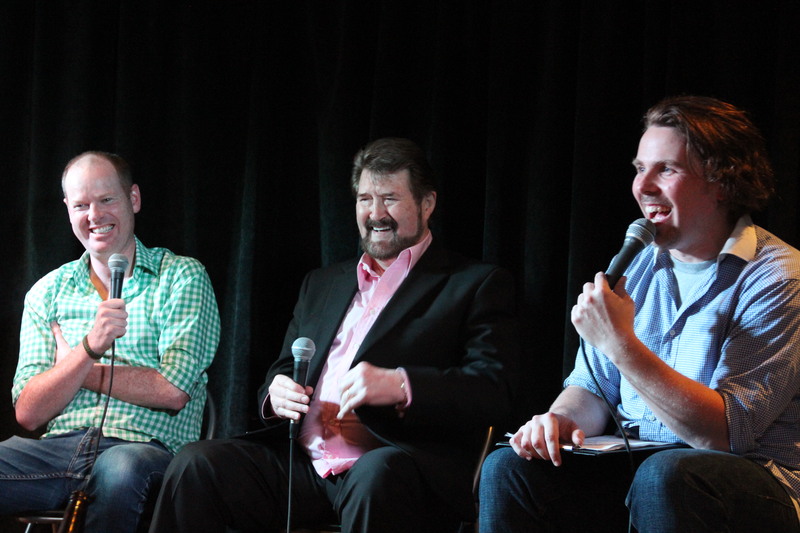 I Love Green Guide Letters recently celebrated one year of podcasts with a live recording that included special guests outstanding comedian Tom Gleeson and amazingly radio legend Derryn Hinch. I was amazed and pleased that Steele found time to answer these questions. Where did the idea for your podcast come from? I was in a really ghetto food court reading the Green Guide Letters which were particularly amazing that day. I actually looked around to see if anyone else was reading them so I could vent about them… but sadly no one was. Instantly I decided to invite friends around each week to ensure someone would chat to me about them. Did anyone help you start it up / teach you how to do it? Unsurprisingly there is a podcast about making podcasts; “The Podcast Answer Man”. I purchased some of his tutorials and they run through all the steps and equipment you need. I have no idea what all the knobs I now own do; I just know where to set them. Admittedly, that last sentence out of context could come back to haunt me. Where do you generally record the podcast? In my lounge room in South Yarra is the normal spot. It makes for a much more relaxed atmosphere than in a studio where people are used to watching what they say. Plus I don’t have to go anywhere and my neighbours are constantly stunned by the celebrities that pop in to visit me. Has the podcast moved beyond its original scope? I actually think it’s pretty much the same format as when I started. Maybe the main difference is we go for a while longer just chatting and riffing about before we get to the letters. Have you thought about the difference between performing comedy on stage & this being recorded for posterity? I trip out that 1000’s of people downloaded a show, just you imagine how big a venue that would be. I kinda get paranoid about what they all think of it. At a stand up show you can hear their reaction. I just have to hope someone tweets me after each episode. How much work goes into preparing the show every week? The pre show prep is simply me circling the best half dozen of so letters and making sure two people show up at the same time to talk about them. Afterwards is far more time consuming; editing, formatting, uploading, then begging the Internet to listen. PLEASE GO LISTEN, I’M TYPING THIS SENTENCE ON MY KNEES PEOPLE! WIL ANDERSON IS ON THE LATEST EPISODE… WHAT MORE DO YOU WANT?! I get the impression that The Green Guide is OK with your podcast and the editor has been your guest, are you relieved and were you surprised at their interest? I was relieved that a letter I received from Fairfax was about a surprise subscription from my girlfriend rather than legal documents. Initially I think they were a bit stand offish about it, but now they really enjoy it. I guess it would be cool if you had a podcast mocking annoying customers at your work. They did an awesome article about the podcast, which was very surreal. Newspaper writes story about a podcast that reviews it’s letters… take that MC Escher. Who have been your favourite guests? That’s obviously a tough one. 16 year old me thinks having Tony Martin on my podcast is a miracle… but 16 year old me also wants to know what a podcast is. I’ve had quite a few already on, so I’m getting a lot more adventurous with my guest dreaming. I have a list of ones within reality that I’ll keep to myself, the unrealistic list has Jerry Seinfeld at the top. Have any guests let you down? I’m too busy judging myself on the podcast to worry about the others. The Tim and Eric one didn’t exactly go to plan… but it features me almost passing out trying not to laugh over them hassling a caller to their office. Do you have a favourite of the podcasts so far? My favourite was probably the first live show. To have all these people attend and know all the running jokes from prior shows; just really cool. Plus on that show I managed to get Andy Kindler, one of my comedy heroes and he loved it. I remember looking over at him and literally just thinking, “Andy Kindler is on my podcast”. Is it hard getting a live show with an audience together? The sound quality is always a huge concern when you’re doing the live shows I still don’t have it perfect, you want the audience mic’ed up to give the listener the live show feel but it’s a hard balance. So far getting the audience hasn’t been that hard but I’m careful not to burn the concept out. I’d love to do every episode live but I think this will be the last live Melbourne show until the Comedy Festival. Was it weird recording the podcast in Sydney – a city that does not have The Age let alone the Green Guide? Yeah that’s kinda odd isn’t it? The fact is doing a podcast about the Green Guide Letters helps listenership in Melbourne but it puts people off elsewhere. But a grip of the podcast reviews on iTunes say along the lines of “have no idea what the Green Guide is or what the shows you are talking about are, but I love the show”. To be honest, most of the shows people write in about… I have no idea what they are. You guys were there at the previous live show when after 10 months we finally found out what “Time Team” was. It was way more fun when we would make up what it was. It’s not about the shows… it’s about the letters. How long is the usual amount of time between recording and getting it up on line. The Green Guide comes out on a Thursday, I try to record by Saturday then have the episode up by Tuesday. That way people can listen to the podcast before the next issue of the Green Guide comes out. Have you had any interesting feedback about the podcast? A lot of homesick Melbournites living overseas really enjoy it. Maybe it helps them stay away? Some other podcasts have dropped out over the year, since the boom began, can you see this one continuing? Of course. But that’s everything, TV shows get cancelled, bands break up. I know two that I listened to every week stopped, but that seemed to be because of people’s paid comedy work getting in the way, which you can’t begrudge… well, as an underemployed comedian I can, but not as a listener. Do you have any advice to keen wannabe podcasters? Try to commit yourself to a schedule and make sure that the schedule is manageable. Doing it by myself weekly… it’s a lot of late nights. Make sure, regardless of how many people are downloading, that it’s fun and that you’re learning from it. Tell us about the Birthday show you recorded in front of an audience on Saturday. A few months ago I shot Derryn Hinch an email asking him to come on the podcast. I’m a huge fan of his radio show and I had a feeling that he would be a hilarious guest that would be too thick skinned to not be a good sport. The same day he replied yes. I actually remember getting the email after a gig and just being… whoa. It was just weird to see an email from Derryn Hinch in my inbox. Of course I wanted him for a live show and with the first birthday not too far off it seemed perfect. It was super hard not telling EVERYONE though, but I really wanted to have nice surprise or shock when he was introduced. Then I needed someone that is hilarious and wouldn’t be intimidated by him, who better than Tom Gleeson? Thankfully without anyone advertised we sold out our cozy little venue and the show was just so fun. I think Hinch really surprised a lot of people. Both Derryn and Tom were killing and the crowd was the best. Just so much fun. Thanks you guys for the support of the show, and to all the amazing talent that have come on to muck about with me and to the Letter Lovers that listen every week; my sincerest appreciation.